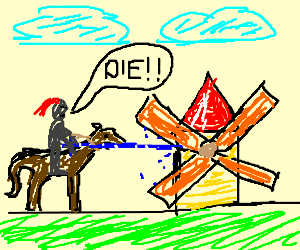 Prepare thyself, windmill, for Don “Quixote” Coram comes to do some tilting. 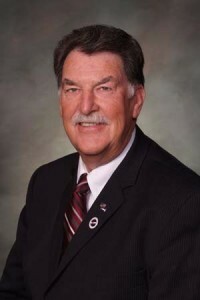 Montrose Republican Rep. Don “Quixote” Coram wants to require voters to present identification at polling places, and as he told the Montrose Daily Press last week, Don’s will…will be done. One way or another, a measure to require voter ID at the polls will be on the 2016 ballot, Rep. Don Coram said. …Vote ID laws have been criticized by the New York Times and others as deliberate attempts to discourage or prevent voting among people who do not have money or means to obtain the necessary identification; a sort of backdoor poll tax. …The two men were among four charged in 2013 as part of a large-scale and controversial voter fraud investigation launched by former Colorado Secretary of State Scott Gessler. Gessler had identified more than 100 people he said illegally voted, but the four charged in Arapahoe County were the only people in Colorado to face charges. In early 2011, newly-elected Secretary of State Scott Gessler testified in Congress that some 16,270 people were illegally registered to vote in Colorado, and some 5,000 of them actually cast ballots in the 2010 election. Gessler wasn’t exactly “Captain Credibility” by that point anyway, but his out-of-left-field numbers of illegal voter registrations immediately raised eyebrows among politicos in Colorado and Washington D.C.
A few months later, Gessler inexplicably reduced that number by a significant amount, claiming to have narrowed the list down to 155 non-citizen voters. Then, in 2012, Gessler sent letters to 4,000 Coloradans he suspected to be illegally-registered to vote. Fast-forward back to November 2015, and you find that “1” is indeed the loneliest of numbers. Ever since Gessler first made his bold accusations in 2011, County Clerks from across Colorado have repeatedly denied that there were any known cases of voter fraud in their counties. Ever. At all. Undeterred, Gessler convinced his patsy, Arapahoe County District Attorney George Brauchler, to press forward with criminal charges that resulted in finding one person who was (knowingly) illegally registered to vote but likely never actually cast a ballot. Thank goodness we put a stop to that! We were thinking the exact same thing, Rep. Coram. How much is enough indeed? 2. Stop Planned Parenthood from selling fetal tissues. 3. Stop Obama from being elected to another term as President. 4. Stop the Ebola epidemic in America. 5. Stop ISIS terrorists from gaining refugee status in the US. 6. Stop Guantanamo detainees, and their peeps, from attacking Florence. 7. Stop Iran from launching it's nukes in a coordinated attack on Julesburg. 8. Stop the War on Christmas. 9. Stop the EPA from polluting our rivers. Your good friend Moderatus would add, "Stop Obamacare" to that list. With all-mail balloting becoming more prevalent, this idea doesn't make a lot of sense. Why don't they focus on accurately counting votes that are cast! I doubt there has been a recount that didn't have different vote totals. Sometimes, recounts even change the outcome. As usual, the GOP focuses on meaningless issues like voter fraud and immigrant terrorists. Even GOP lawyer Ben Ginsberg agreed with the Presidential Commission on Election Administration report that incidents of voter fraud are rare. And, as I have said here before, the biggest threat to my personal safety is not immigrants, but the dangerous drivers talking on cell phones that I have to evade each and every day. Why not pass a law banning cell phones while driving !?! Is the one Jon Caldara? Someone should clue Don Coram in that identification is still required when voting in person. This can be a utility bill, student ID, or any other acceptable ID. Coram just wants to make it state-issued picture ID. That requirement will probably disenfranchise poor, less-educated, and minority voters, leading to net voter turnout decreases of ~ 2%, and a net Republican gain of .4% to 1.2%, per Nate Silver's analysis on 538.com. I thought that these conservatives were advocates of "less government", and "getting big brother out of our business"…. So why are they not screaming about governmental overreach in requiring this intrusive ID for citizens to exercise their voting rights? In any event, the percentage of people who insist on voting in person is shrinking in Colorado. Statewide, accurate comparison of mail in ballot turn-in to in-person turn out is not yet available. However, my own informal perusal of election audits in Weld, Denver, and Pueblo counties shows that people prefer to vote by mail by a factor of 5:1 (Weld and Pueblo) or 120:1(Denver). I compared figures for DRE (voting directly on a machine) to figures for CCOS (optically scanned paper ballots). Nationwide, as opportunities to use "alternative methods" of voting increase, absentee and early voting increases. (per Census Bureau study, "Who Votes?" 1978-2014). So Coram is really barking up the wrong tree. Most Coloradans don't go to the polls to vote anymore -t hey turn their ballots in. Clerks at the DMV or their university or wherever have already verified the identities of voters. Back to the drawing board, Don Coram – try another propaganda campaign to try to preserve Republican power. If Coram is willing to put a financially reviewed amendment on that says the state will reach out to all voters over the next two general election cycles to ensure that they have proper ID – including all of the expenses involved in research, document retrieval, and the assorted costs for getting each and every voter (and future voter) a proper ID, I might support him. People who don't have IDs often could benefit from having one – and the documentation to support it. Of course, he'll have to figure out where to get the money in the budget. Thanks mama. Government overreach in restricting voting is another one of those idiot "White is black. Black is white" arguments that expose what true hypocrites these people really are. They are not really concerned about lessening government involvement in our society. That just want it done so that they gain a permanent political advantage. You nailed it with your post. Loved the drawing Pols. Who are you guys to come up with such delightfully, demented graphics? This is disappointing, given Rep Coram's forward-thinking approach on things like LARC.